If it is emergency service that you need, we are available to assist you, 24 hours a day, 7 days a week. 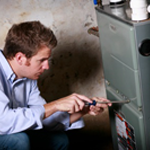 We can offer you performance tune-up service for all your heating and cooling systems. Contact our service department to discuss your type of equipment and service required and estimated cost to perform.